Today a federal judge struck down Utah’s Amendment 3, which banned gay marriage in our state. 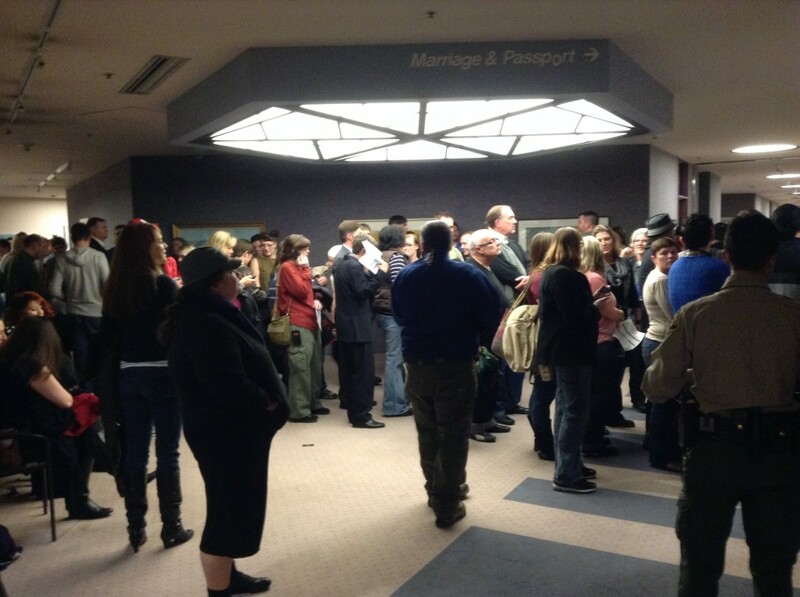 Shortly after, couples arrived at the Salt Lake City courthouse to receive their marriage license. You can read the full story here. Beth and I went down there a little after 7:00 p.m., to see the couples and just to be a part of this amazing day. The courthouse usually closes at 5, but the line to the licensing office was over 200 people deep, officials said anyone in line at 5 would be allowed in. When we got there at 7, there was a good 50+ people still waiting. We got to the courthouse a bit after 7. huge line at the clerk’s office. Door closed, with security guards. People (with licenses) were getting married out in the hallway, totally oblivious to all the noise around them. v. happy. Everyone who got in the clerk’s office before 7 was gonna get married. Everyone else who was still in line is going to have to wait. It was great. There were several news crews and photographers there, of course, and families of those getting married. But it also appears there were people who just came down to the courthouse to, like us, just observe. 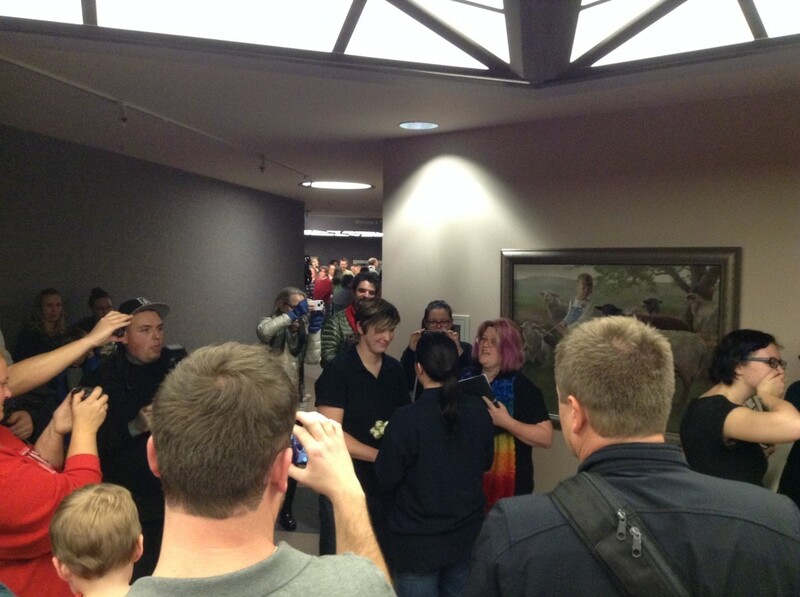 People were getting married in the hallway and spaced outside of the clerk’s office. Several people officiating the marriages at once. Everyone was so happy. Who could be there, among all those lovely happy people, and say, “this is a bad thing.” It was beautiful. Eventually, they had to turn people away because it was past 7:30, but Senator Dabakis addressed the crowd and said they’d be trying to get the clerk’s office open tomorrow to process more marriage applications. 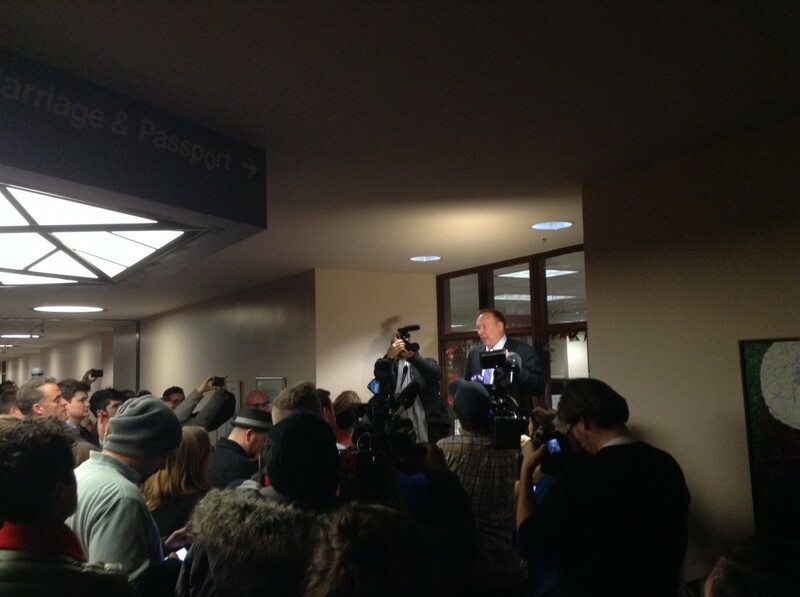 Senator Dabakis addresses the crowd after they closed the clerk’s office.